Marvel Premiere #8, 1973. “The Doom That Bloomed on Kathulos” | Magazines and Monsters! As if Dr. 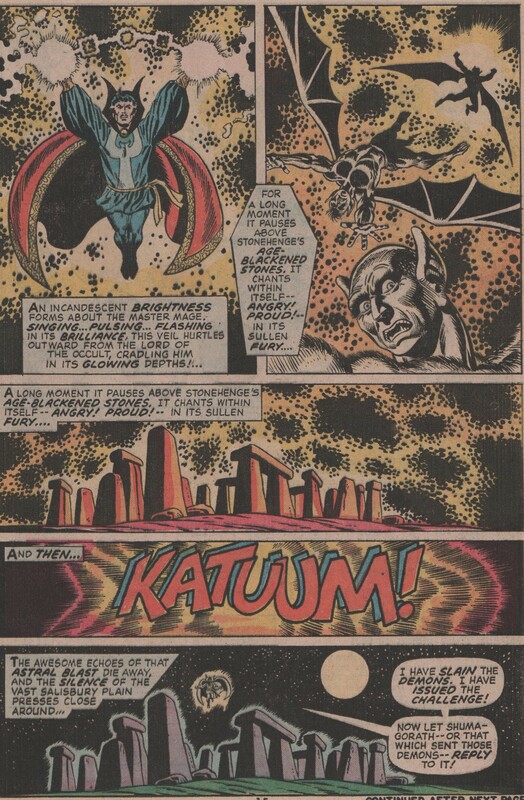 Strange, Clea, and Stonehenge wasn’t enough, you get a story inspired by the fantasy legend, Robert E. Howard, scripted by Gardner Fox, pencils by Jim Starlin, and inks by Frank Giacoia! This A-list creative team brings us a tale of the good ‘ol Doc, as he and Clea have faced down trial after trial lately. 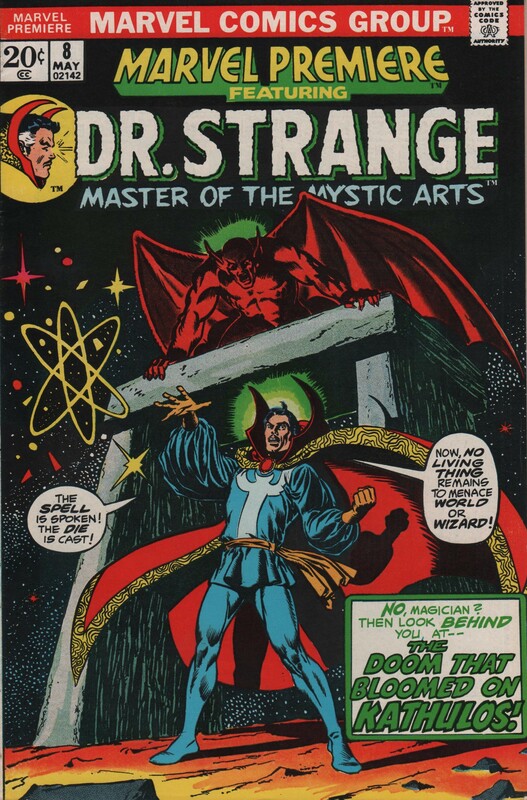 In this issue, Strange finds out that not only must he face Kathulos in some dark, creepy dimension, but that if he does, waiting in the wings is his master Shuma-Gorath! We also see in flashback, these last few days, and its bizarre adventures. From an undersea nightmare, to another demon, spawned to serve Shuma-Gorath. Throughout the book, we get amazing work by Starlin, and it really shows how great he would have been on a title like this one. Don’t get me wrong, I love Frank Brunner, Gene Colan, and all the other artists on the different series, but the awesomeness of Starlin’s work cannot be denied! 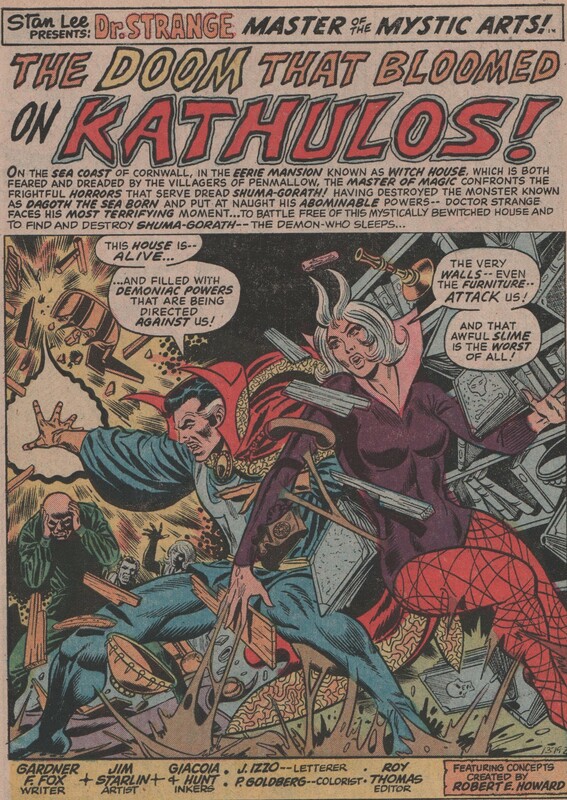 Just look at those panels, by Starlin, Giacoia, Hunt, and Goldberg! Let us not diminish the writing by comic book great, Gardner Fox! His Golden and Silver Age work is nothing short of astounding (JSA, Starman, Sandman, etc.)! Adapting the works of a great writer like Howard doesn’t hurt your chances at making something great either though. Howard’s countless creations (Conan, Kull, Solomon Kane, etc.) have inspired hundreds of writers, artists, and authors for decades. And I’m sure they will for many more to come! See you soon!